Arsonists are believed to have started a huge blaze which destroyed a warehouse crammed with plastics. 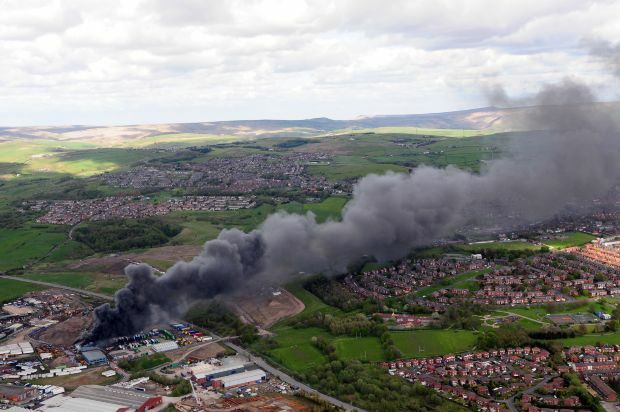 At the height of the blaze, some 60 firefighters were tackling the spectacular fire in Oldham on Saturday. Fire crews arrived just before 3pm and found the huge warehouse on Meek Street ablaze. They used a number of hose reels from four engines including an aerial platform to stop the fire spreading to adjacent building. But their efforts were hampered when a large water main they were using suddenly burst and the building suffered a partial collapse. They managed to bring the fire under control after about four hours at the scene. Nearby residents were advised to keep their windows and doors shut until the plume of smoke coming from the building clears. Firefighters expect to remain at the scene for several days while they ‘dampen down’ the smouldering remains. The warehouse was ‘full from wall to ceiling with plastics, carpets, vinyl and foam’, according to a spokesman for Greater Manchester Fire and Rescue Service.